The appellants, Kate Marie Healy McCann and Gerald Patrick McCann, after being notified of fls.2739 et seq. of the ruling, argued at fls. 2793 et seq. 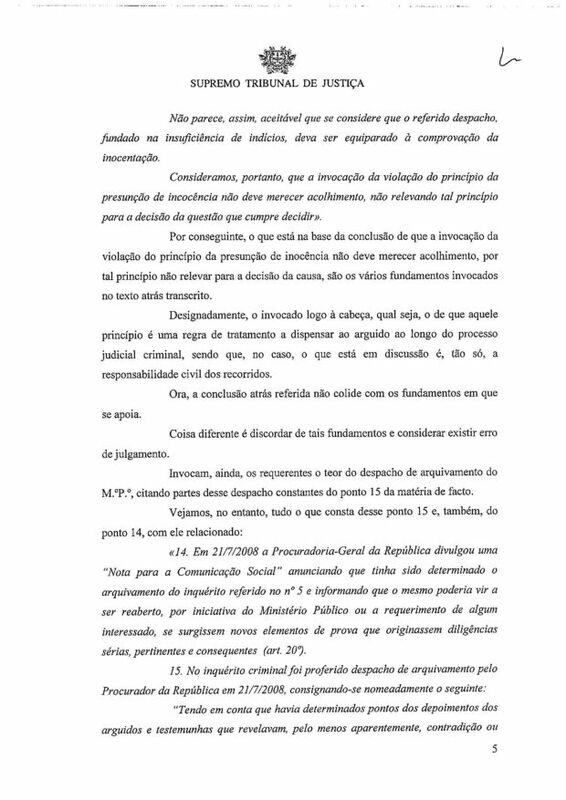 before the assembly the nullity of that ruling, under the terms and for the purposes of articles 615-1b/e, 4 and 666 of the Civil Procedure Code. 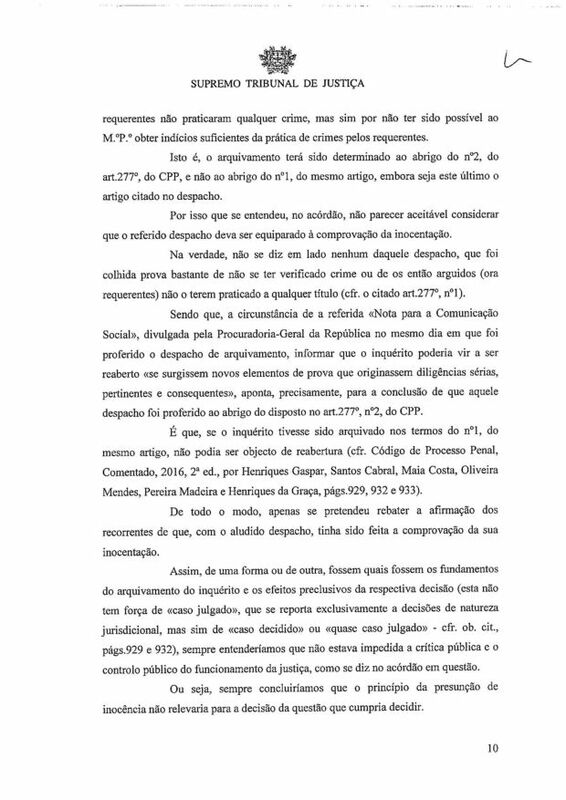 The respondent Guerra e Paz Editores SA, answered, concluding that the allegation of nullity had no legitimacy. The assembly has to decide, the examination of the minutes having been dispensed. 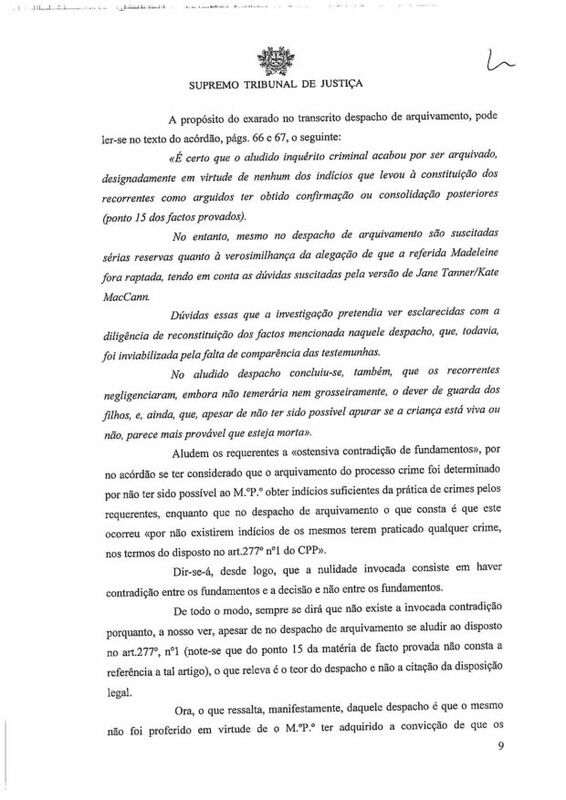 The appellants claim a lack of ground for the conclusion reached by the court that the principle of the presumption of innocence cannot be called upon in the minutes to restrict the right to freedom of expression, as the starting point was the mistaken assumption that the criminal proceedings were brought to a close because “the Public Ministry had not been able to obtain sufficient evidence concerning the practice of a crime by the appellants”. They (the appellants) conclude that the defects of contradiction between the factual basis and the conclusions reached in the ruling, as well as the lack of ground, must be remedied. According to the provisions of articles 615-1b, 666-1 and 685 of the CPC, the ruling is invalid when it does not specify the factual and legal grounds for the decision. Thus, what the law considers null is the absolute lack of motivation, that is, the total absence of legal and factual grounds. Well, it is obvious that this is not the case here, since the ruling at stake specified those grounds. Essentially, what it is all about is the appellants' disagreement with the decision of that ruling and they certainly consider that the statement of reasons is wrong. This, however, does not produce nullity, it can only affect, if it occurs, the doctrinal value of the ruling. On the other hand, under the terms of articles 615-1c (first part), 666 and 685 of the CPC, the ruling is invalid when the grounds are in opposition to the decision. 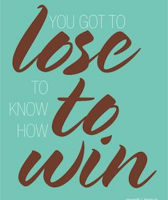 Here, it is a ruling which is vitiated by a logical defect that compromises it, since the grounds relied on therein logically lead not to the result expressed in the decision but to the opposite outcome. The appellants allude to contradictions vices between the factual grounds and the conclusions reached in the ruling. However, it does not appear that there is any contradiction between the grounds and the decision, nor do the appellants point them out with rigour, claiming that this happens when the ruling refers to the relationship between their rights to good name and reputation and the presumption of innocence. Nevertheless, the Court of Justice of the European Union has decided that the principle of presumption of innocence does not apply to civil proceedings (mainly compensatory) subsequent to criminal proceedings, at risk of depriving the victim of her own right to accede to the courts and to be compensated (Cf. the judgements in Y vs Norvvay (56568/00) of 11/ 5/2003 and Diacendo vs Italy (124/04) of 05/07/2012). Thus, in addition to the recourse to the jurisdictional way, by opening the inquiry (art. 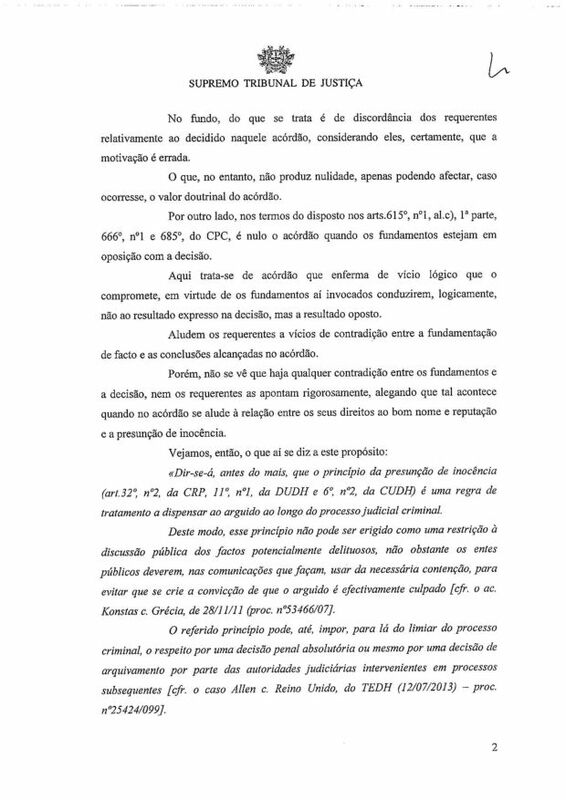 287 of the CPP) and the complaint to the hierarchical superior (art. 278° of the CPP), the investigation can be reopened if new elements of evidence arise invalidating the grounds called upon by the Public Ministry in the filing dispatch (art. 279 of the CPP). This is indeed even mentioned in the Memorandum to the Social Communication released by the Attorney General's office on 21/7/2008 and announcing that the filing of the investigation had been decided. It was reported that it could be reopened on the initiative of the Public Ministry or at the request of any interested party if new elements of evidence arise triggering serious, pertinent and consequential proceedings (n°14 of the proven facts). And the safeguarding of the authority of the judicial power (cf. article 10-2 of the European Convention on Human Rights) is not alluded to, since is definitely outdated the traditional idea that criticism against the judicial power must be proscribed as it contributes to the undermining of its dignity, authority and credibility in the long term. The best guarantee of dignity of all State institutions in the long run consists in its permanent opening to public criticism (cf. 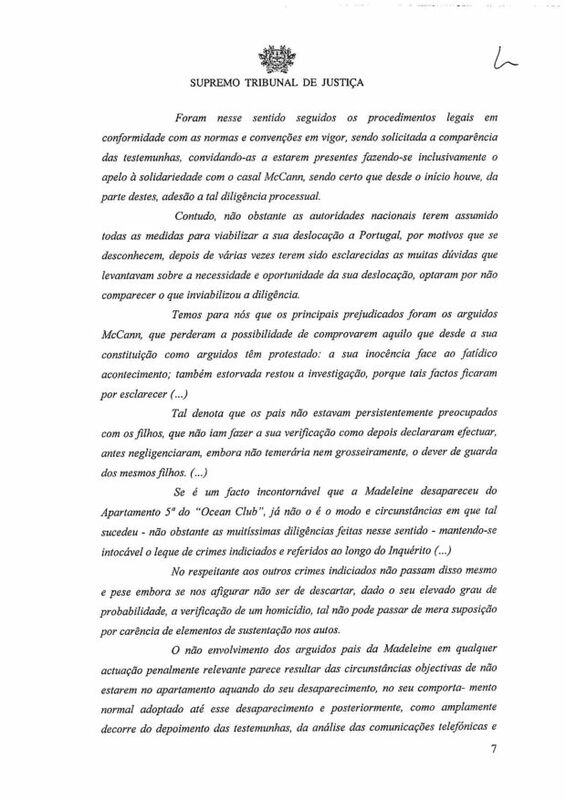 Jónatas Machado, Freedom of Expression - Constitutional Dimensions, op. cit. pp. 566-7). In fact, that dispatch was not proclaimed by virtue of the Public Ministry having gained the conviction that the appellants had not committed any crime (cf. art. 277 of the CPP). Consequently, the bases for the conclusion that invoking the breach of the principle of presumption of innocence should not be upheld, since that principle is not relevant for the decision at stake, are the various grounds alluded to in the text transcribed above. In other words, what is called upon right from the outset is that this principle is a rule of treatment to bestow upon the defendant throughout the criminal judicial process. At present, however, the issue is only the civil responsibility of the respondents. The above conclusion does not collide with the grounds on which it relies. It is not the same to disapprove such grounds and to consider that there is an error of judgment. 14. 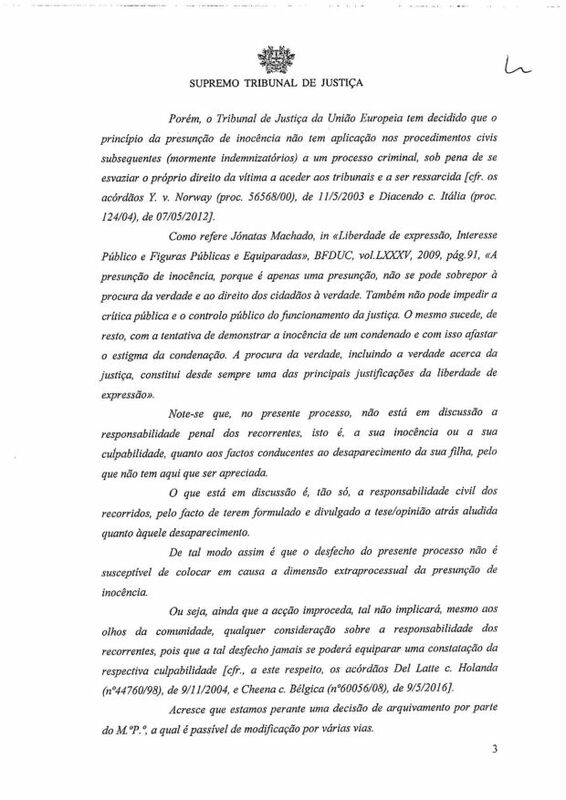 On July 21, 2008, the Attorney General office issued a "memorandum for the media" announcing that the investigation referred to in paragraph 5 had been closed and that it could be reopened on the initiative of the Public Ministry or at the request of any interested party, should new evidence arise that could lead to serious, pertinent and consequential proceedings (article 209). 5 - The obvious and well-known advantages of immediate appreciation of evidence, or in other words, the fulfilment of the principle of contiguity of evidence in order to form a conviction, as firm as possible, about what was seen by Jane Tanner and the other protagonists, and, eventually, to dismiss once and for all any doubt that may subsist concerning the innocence of the missing child's parents. 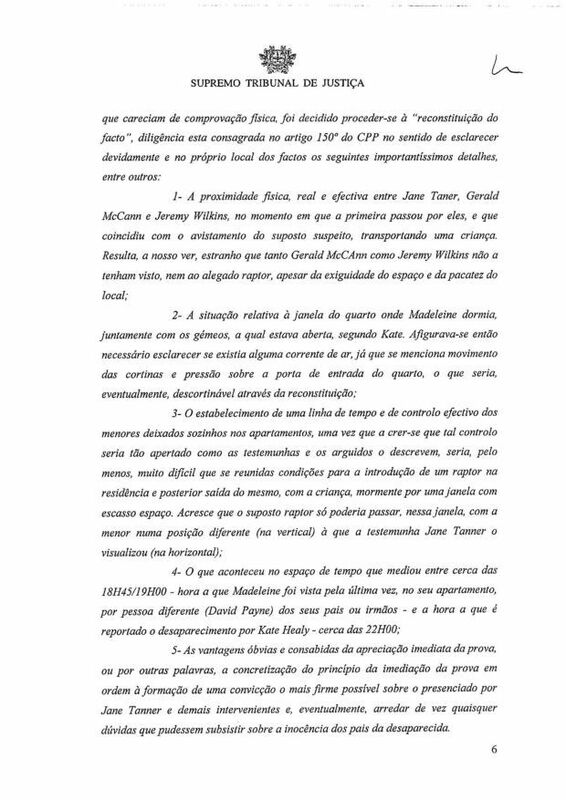 To this effect the legal procedures were followed according to the norms and conventions that are in force, and the witnesses' appearance was requested, inviting them to be present, inclusively appealing to solidarity with the McCann couple, as it is certain that since the beginning they adhered to that process intervention. Nonetheless, despite national authorities assuming all measures to make their trip to Portugal viable, for unknown motives, after raising many doubts about the necessity and opportunity of their trip that were clarified several times, they chose not to attend, which rendered the intervention inviable. Concerning the other indicated crimes, they are no more than that and despite our perception that, due to its high degree of probability, the occurrence of a homicide cannot be discarded, such cannot be more than a mere supposition, due to the lack of sustaining elements in the minutes. … also from the experts' conclusions, namely the reports from the FSS and from the National Institute for Legal Medicine. Moreover, in fact none of the clues that led to their constitution as arguidos happened to be later confirmed or consolidated. So let us see: the information concerning a previous alert of the media before the police forces was not confirmed, the residues marked by the dogs were not corroborated in laboratory, and the initial indications from the above transcribed email, better clarified at a later date, ended up revealing to be innocuous. 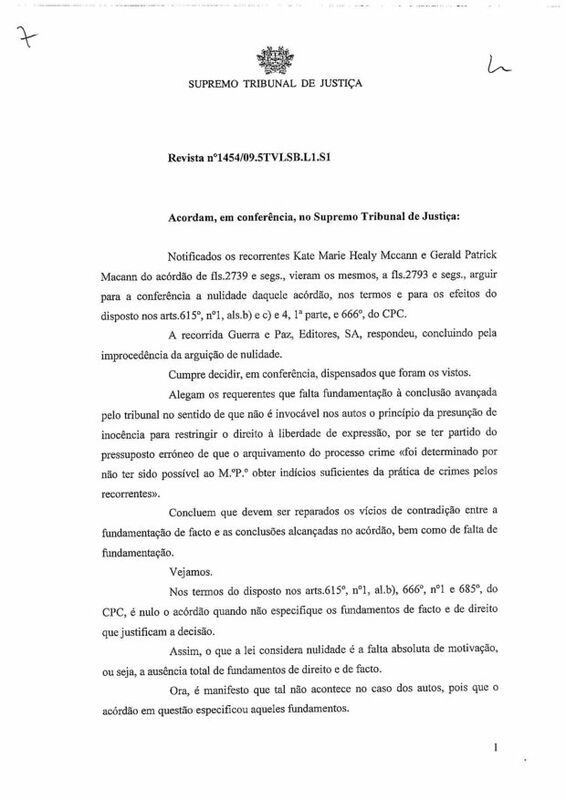 It has not been possible to obtain any piece of evidence that would allow for a average man, under the light of logic criteria, of normality and of experience's general rules, to formulate any lucid, sensate, serious and honest conclusion about the circumstances under which the child was removed from the apartment (...), nor even to produce a consistent prognosis about her destiny and inclusively - the most dramatic - to establish whether she is still alive or if she is dead, as it seems more likely. 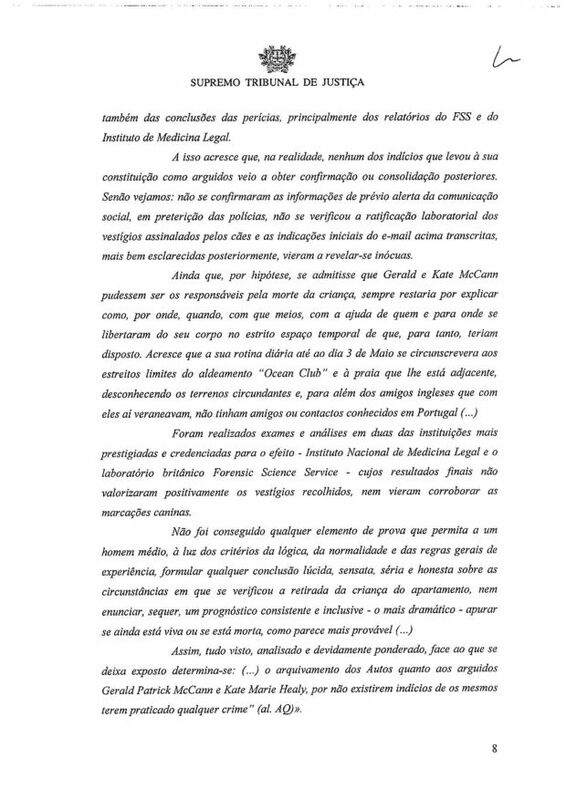 The archiving of the process concerning the arguidos Gerald Patrick McCann and Kate Marie Healy, as there are no indication of their practice of any crime (al. AO). The appellants alluded to the “ostensible contradiction of grounds” because the ruling held that the closure of the criminal proceedings was determined since it had not been possible for the Public Ministry to obtain sufficient evidence of the commission of crimes by the appellants, whereas the filing order states that it occurred "because there were no indications that the appellants had committed any crime, in accordance with the provisions of article 277-1 of the CPP". First of all, let us say that the nullity pleaded consists in contradiction between the grounds and the decision and not between the grounds. In any case, it will always be said that the alleged contradiction does not exist because, in our view, although the filing order refers to the provisions of article 277-1 (note that the point 15 of the proved factual matter makes no reference to that article), what is pertinent is the content of the order and not a quoted legal provision. … did not commit any crime but because it had not been possible for the Public Ministry to obtain sufficient evidence of the commission of crimes by the appellants. It means that the archiving would have been determined under article 277-2 of the CPP, and not under the first paragraph of that article, although the latter is quoted in the order. This is why it was judged in the ruling that it would not seem acceptable to consider that the order should be treated as a demonstration of acquittal. In fact, it does not appear anywhere in the order, that the collected evidence was sufficient to confirm that no crime was committed or that the then arguidos (here appellants) did not commit it in any sort of way (cf. quoted article 277-1). The fact that the aforementioned “Memorandum for the media”, published by the Attorney General office on the same day as the filing order, informed that the investigation could be reopened “if new evidence arose that could lead to serious, pertinent and consequential proceedings”, precisely points out that the order was issued pursuant to article 277-2 of the CPP. In fact, if the investigation had been closed according to the terms of the first paragraph of the same article, it could not be reopened (cf. 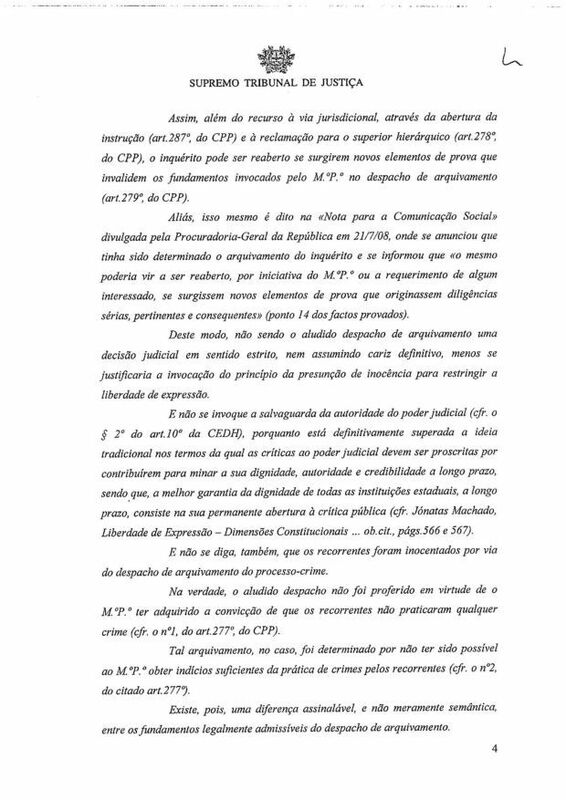 CPP, reviewed, 2016, 2nd ed., by Henriques Gaspar, Santos Cabral, Maia Costa, Oliveira Mendes, Pereira Madeira and Henriques da Graça, pp.929, 932-3. Anyhow, the intention was only to counter the appellants' assertion that, with the aforementioned order, it had been demonstrated that they were innocent. Thus, in one form or another, whatever the grounds for the closure of the investigation and the preclusive effects of the respective decision (that has not the value of res judicata, which refers exclusively to decisions of a judicial nature, but is a “decided case” or “close to res judicata” - cf. op. cit. pp. 929 and 932), we would always consider that the public criticism and the public scrutiny of the functioning of justice were not impeded, as stated in the ruling in question. That is to say, we would always conclude that the presumption of innocence principle would not be pertinent for the decision on the issue that we had to resolve. We have therefore to conclude that the ruling is not invalidated by the nullities of article 615-1b,c of the CPC, applicable through the combined provisions of articles 666-1 and 685 of the same Code. In the light of the foregoing, the filing of nullities of fls 2793 et ​​seq. is dismissed and the appellants condemned at the expense of the incident which they gave rise to. 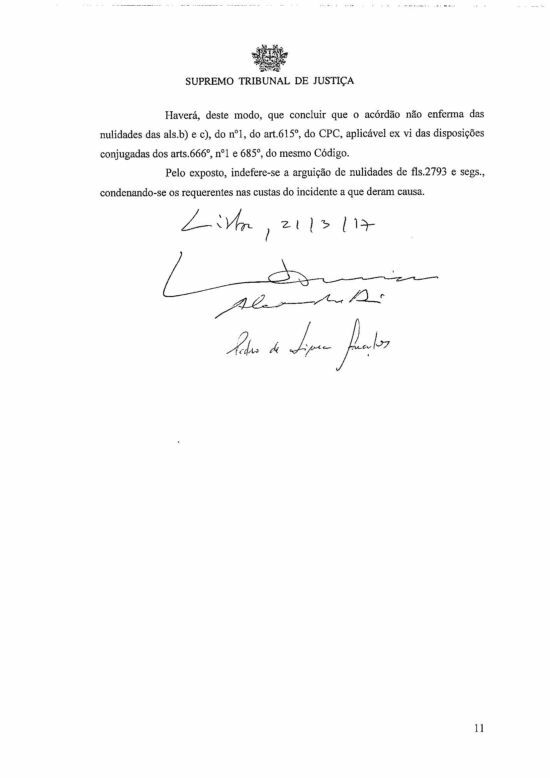 The document is signed by the three same magistrates who signed the 31.01.2017 ruling : Jorge Manuel Roque Nogueira, Alexandre Reis and Pedro Lima Gonçalves.